Austin Watson will return to the Nashville Predators lineup Tuesday night for the first time since being suspended by the NHL more than two months ago for alcohol abuse. 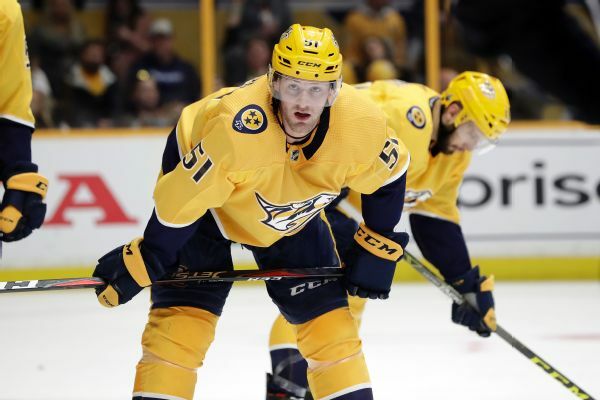 The Nashville Predators have put forward Austin Watson on a long-term injury loan to their American Hockey League affiliate, a week after he earned reinstatement from the NHL. Predators forward Austin Watson has been reinstated after being suspended in January and admitted to the league's substance abuse and behavioral health program. Nashville Predators forward Austin Watson has been indefinitely suspended for "his ongoing issues with alcohol abuse." 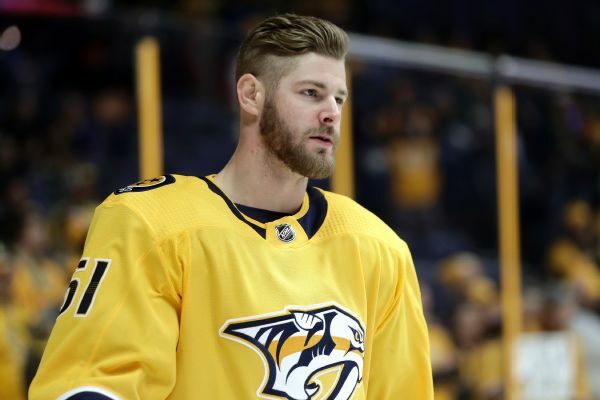 Nashville Predators forward Austin Watson said his arrest last year came when he started drinking again after 23 months of sobriety, and said he is "currently sober and committed to living a healthy lifestyle." The girlfriend of suspended Predators forward Austin Watson said in a statement Saturday that the June 16 incident between the two "was not an act of domestic violence." The NHL is criticizing an arbitrator's decision to reduce the suspension of Nashville Predators forward Austin Watson, who pleaded no contest in July to a domestic assault charge. Predators forward Austin Watson's 27-game suspension for domestic violence has been reduced to 18 games by an arbitrator. Nashville Predators forward Austin Watson has been suspended without pay for the entire preseason and the first 27 games of the regular season after pleading no contest in July to a domestic assault charge. The Predators' Austin Watson, who was arrested in June after an incident involving his girlfriend, has pleaded no contest to misdemeanor domestic assault.